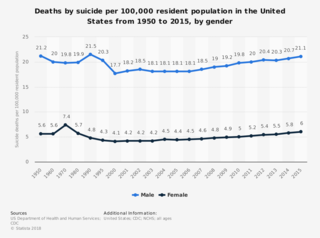 WaPo ran an article showing Suicide Numbers trending up: they glossed over many important causes and missed how minute the increase is, and demonstrated mostly clickbait/FakeNews. We have better reporting - cops used to be reluctant to label suicide and use accident or unknown because of insurance purposes and stigma. Instead of asylums we're medicating large swaths of the population with anti-depressants that have questionable results for many, and negative results for a few. suicide is contagious: one can encourage copy-cats, and media and social media improved communications, which makes the impacts wider. Progressives are sucking all the joys and vices out of life, polarizing everything and telling everyone what to do, and how to do it -- as well as bankrupting people under burdensome taxes and regulations. And making our society more pedigree conscious with more stressors. Your life can be ruined by false allegations like sexual misconduct, racism, sexism, etc., thanks to more political correctness (e.g. getting James Demore'd). TV/Movies/Social media focuses on pretty people or how much better everyone else is doing (with a few exceptions), and that injects feelings of failure. Who here is shocked that the outcome of these changes are that a few will choose suicide? Yet, if you zoom out a little, you find that it's not trending up much at all. And from the 60's and 70's it shot up, and then it trended down until 2000 when it started trending up again, and we're just barely above the 1950's and 1960's level. Not offering that broader context is FakeNews. This page was last edited on 11 February 2019, at 03:11.